Here’s an interesting item found in one of the many small shops in the Ameyoko district near Ueno Station. 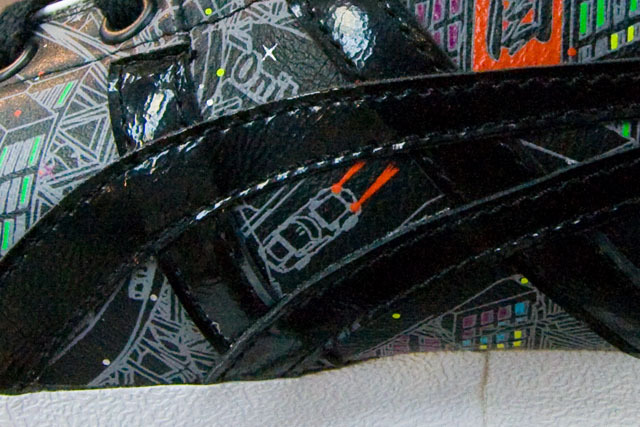 It’s a glow-in-the-dark shoe featuring a Toyota 2000GT. 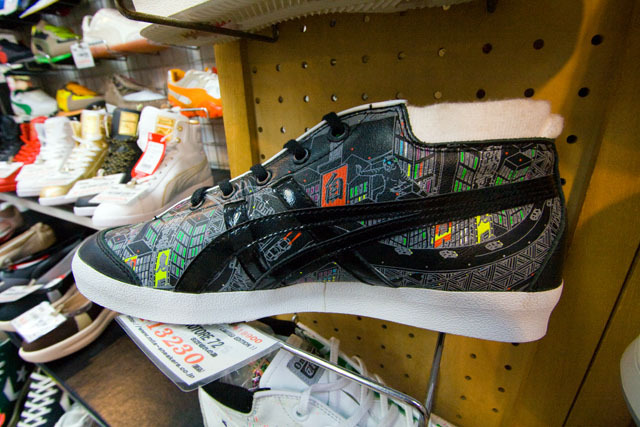 We’re not sneaker freaks, but we tend to gravitate towards anything vintage and Japanese, and in recent years Japanese sneaker company Asics has been bringing back some of its very cool old school designs under the Onitsuka Tiger label. A little research revealed that the 2000GT shoe was a limited edition created as part the Electric Tiger Land campaign (the video in the link clearly shoes a 3-D 2000GT being rendered). It’s kind of cool that when they decided to come up with a stereotypically Japanese theme that includes skyscrapers, Super Sentai and subways, they chose the original Toyota supercar to represent the automotive side of things. This campaign ended last year though, replaced in 2009 by a new campaign celebrating the company’s 60th anniversary (this video has a glimpse of a first-gen Honda Civic). But if you want the 2000GT shoe, it’s probably still there at the shop where this photo was taken. Closeup of the largest of five 2000GTs after the jump. It’s headlights glow in the dark. tagged: asics, asics onitsuka tiger, honda, honda civic, onitsuka tiger, toyota, toyota 2000gt. The Electric Tiger Land link can be followed through, and those shoes can be purchased in the US, so no need to wait on a trip to Japan. Some of the other Tiger shoes look pretty nice. (Sorry, the city illustration is too loud for me. Sort of like a Piazza, beautiful to see on the road, but too ostentatious to be seen driving. But retro Tiger shoes would be an excellent fashion accessory to go with my nostalgic Japanese car). I’ve always liked the US market Asics shoes, do the Tigers stack up in fit and finish to the regular US market offerings? Are the actual 2000GT shoes are available in the US? I thought it was the other Onitsuka Tiger styles but if they are please post a link! I’m not a shoe kind of guy, but I found it. Thanks for the link, TG. It’s ugly but man, it has a 2000GT on it!